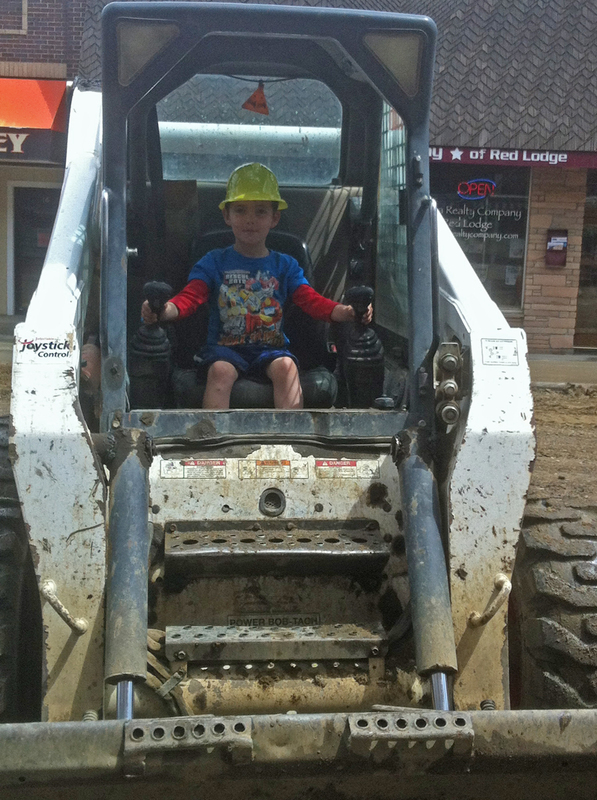 My grandson posing in a piece of construction equipment outside of our store. A friend of mine named Judith Gregory popped in to my store to chat a while ago. As we talked, she looked out the front window at the construction equipment that was ripping out half of the street to replace the water main through downtown Red Lodge. Judith then made an observation that would start a big ball rolling. She’s right. Businesses on Broadway get a steady flow of requests. Can you donate a door prize or raffle prize for our charity event? Would you sponsor a table for our charity dinner? Can you kick in $50 to help a student take a field trip? Will you donate a gift card for our silent auction? Would you buy some cookies? Donate a gift basket? As we talked, I told Judith about cash mobs. We’ve all heard of a flash mob. This is a similar concept, specifically designed to support small businesses. There are very few rules for a cash mob (if wouldn’t be much of a “mob” with a bunch of rules, would it? ), and everybody does them differently. In a nutshell, you gather a group of people and pick a business. Everyone in the group shows up at the business at the same time and spends some money. It doesn’t need to be much. Fifty people spending $20 each is quite the shot in the arm to a mom & pop shop. Judith’s thought was that each nonprofit in Red Lodge could pick a block of the downtown. With our little five-block historic downtown and dozens of 501(c) organizations, each side of the street in each block could have a couple of sponsors. The nonprofit would then use their mailing list to encourage their donors, board members, and volunteers to come out one Friday evening and shop that block. Again, it doesn’t need to be much: buy a drink at the pub, have a bite to eat at the restaurant. Buy a book at the bookstore, a vase at the clay center, a plant at the flower shop. It wouldn’t take much to make up for the effect the construction has had on business. Each year the town has a Christmas Stroll where businesses stay open late and people stroll the streets and shop. This would be kind of a Construction Stroll. Judith took the idea to the Red Lodge Area Community Foundation, which agreed to help sponsor and promote the event. The idea has morphed since Judith’s original concept, becoming the “Rumpus on Broadway.” Despite the changes, however, Judith’s original concept shines through. This Friday from 6:00 to 8:00 pm, the nonprofits in our area will be helping to support the businesses that support them all year. It’s a wonderful concept, and the beauty of it is that the event reminds us what a community really is. Red Lodge isn’t a pile of bricks and mortar in a beautiful setting: it’s a bunch of people helping to support each other. Thank you, Judith. You are one of the people that makes this a wonderful place to live.